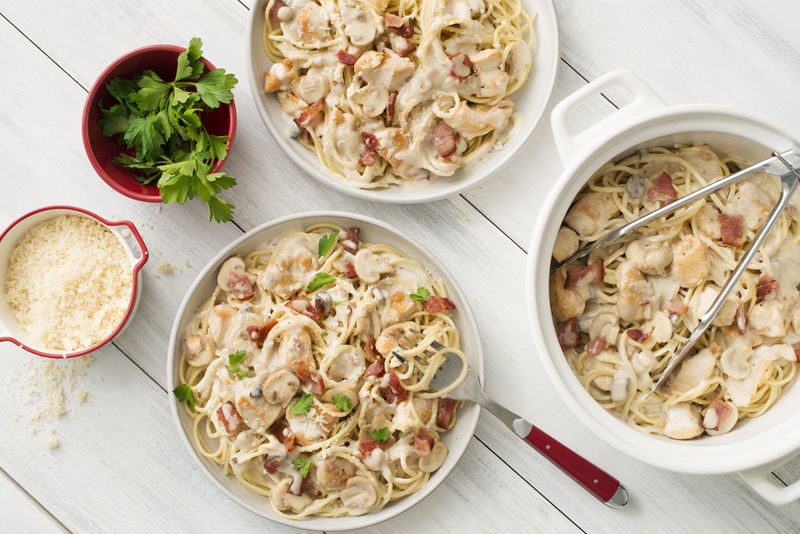 Classic Chicken Carbonara recipe combines savoury bacon pieces with a rich, creamy sauce made with CAMPBELL'S® Condensed Low Fat Cream of Mushroom Soup. In a large skillet over medium heat, cook bacon 8-10 minutes, stirring often, or until crisp. Transfer bacon to paper towel lined plate to remove excess fat. Remove all but 1 tbsp (15 mL) bacon fat from the pan. Add mushrooms, onion, and garlic, sauté 3-5 minutes or until soft. Add chicken. Cook 3-5 minutes, stirring often, or until no pink remains on the chicken. Stir in soup, milk and thyme. Bring to simmer. Return bacon to the pan. Reduce heat and simmer for 4-5 minutes or until chicken is cooked through. Remove from heat.Stir through parsley.Serve over cooked spaghetti topped with Parmesan cheese, if desired. For a fresh twist on this classic dish, try adding baby spinach while the sauce simmers. 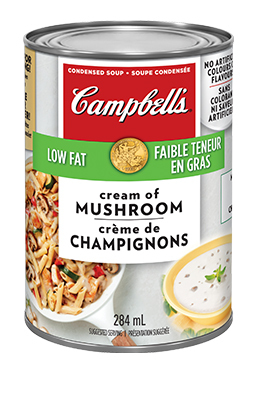 To maintain creaminess, heat leftovers with a splash of milk. Feel free to season with salt and black pepper to taste.